In the US, both the chairman of Federal Reserve and politicians agree that unemployment is the biggest economic problem. The winnable candidate therefore in this upcoming election in November is the one who can create and increase the number of jobs. However, according to a recent telephone survey, the public think differently. They are now economically informed. 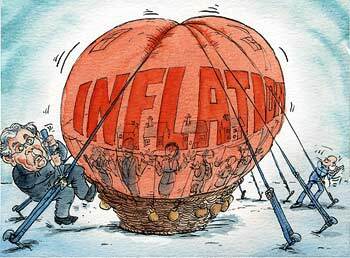 For them, inflation is the biggest economic problem. Here in South Korea, my impression as a result of brief observation is that the people are aware about the external source of their national economic crisis even though inflation is not particularly identified. Despite my failure to understand the language, I am surprised to see the face of Bernanke appearing on mainstream news. In the Korea Herald, an English newspaper, I also keep on encountering economic news, which are almost similar to what I have been reading in the web. Also, when I borrowed books from the public library here in Gwacheon, South Korea, I appreciate that economic professors like Sunhyuk Kim and Doh Chull Shin of Seoul National University Press are aware about the external source of the Korean economic crisis. I am referring to Economic Crisis and Dual Transition in Korea: A Case Study in Comparative Perspective. In the Philippines, in my opinion, we cannot see such kind of awareness. It is, as if, you need to come out from the country to see its economic reality. A Filipina teaching here in South Korea asked me a question if there is still hope for the Philippines. I told her, “Yes, there is hope provided that we have Filipino politicians with qualities of statesmanship, knowledge, and courage to reform the Philippine monetary system.” Unfortunately, at present we cannot find such breed of politician. Our people feel the economic pressure, but they fail to identify the real cause of the problem. Many are still looking for political changes as their only hope. I do not doubt the vital role of the politicians for the country to experience economic reform. However, I think nothing will happen if we will passively wait for initiative coming from them. It is more proper to expect financial and economic reform from the intellectual community – educators, religious leaders, journalists, and bloggers. Such an intellectual movement will create economically educated masses that will provide the necessary base to pressure legislators to pass bills on monetary and financial reform. I am still praying and looking for a public servant whose advocacy focuses on monetary reforms just like what Ron Paul has been doing in the US. Kindly inform me if you happen to encounter one.